The following extract is from a cello sonata by Camille Saint-Saens. Look at the score and answer the questions below. The piece is in C minor. Name another key which uses the same key signature. (Answer). Give the technical name of the note in the cello bar in bar 3. (Answer). 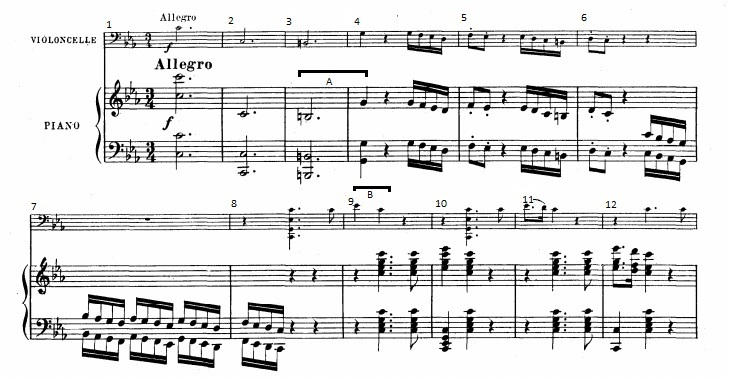 In bar 5, the notes played by the cello form part of which minor scale? (Answer). Name the melodic intervals marked with a bracket as A and B. (Answers). Hi Rose – could you do me a big favour and email me the address page you were on and the link that didn’t work. I am not aware of any problems and haven’t seen anything go wrong myself. Many thanks!